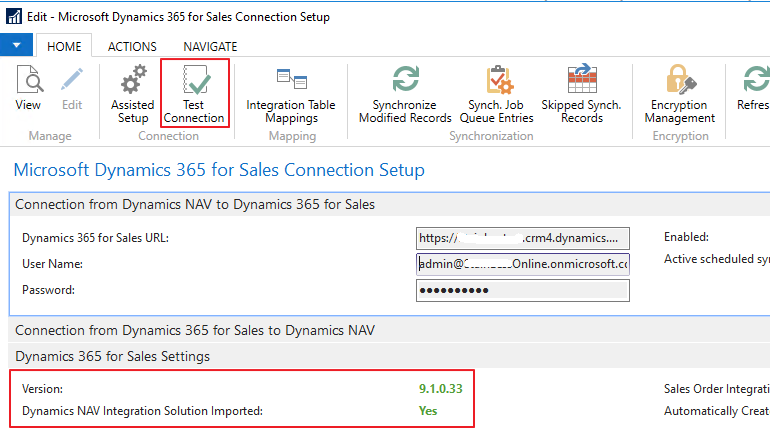 In this post we will see how to modify and add custom table to Nav connector for Dynamics 365 CRM (also working with Ms Dynamics CRM 2016). Since Nav 2017 Microsoft decide to integrate a CRM connection system directly in Nav. With this system all data integrations are managed Nav side for both “Nav to CRM” and “CRM to Nav” flow. This system is a simplificatio of older external tool who have to be connected to both Nav and CRM. An impotant information that can’t be found on Ms posts is that this connector did’nt handle any data deletion. If a record is insert in nav, synchronized in CRM, a delete in Nav will not be repercuted in CRM (or would need some specific developments). Microsoft is using “Integration” table concept to manage/compare data before integrating them in both synchronization way. Integration tables are used as a buffer between the two systems. Microsoft strategy is to disable any modifications through page “Integration Table mappings” and “Integration field mappings”. This avoid any modification from a not technical user I guess. Solution give by Microsoft to modify the mapping is to open tables (5335, 5336) from Nav developement environement. Another solution is to modify the default mappings setup code explain in Step 2. It allow you to build the mapping, create the job queue and enable synchronisation for existing records. This is not automatic with previous solution. It’s also avoiding the need of export/import mappings setup if we want to put it in another Nav base. Important point is to use the cmdlet including all CRM entities related to the custom table you want. The minimum relation is systemuser (for ModifiedBy/CreatedBy fields that are alway present in CRM entities). If all run good you will have your .txt in the specified folder that you can import in Nav. If related entities are already in Nav (like CRM Systemuser) it’s not necessary to reimport it. Be careful, this cmdlet is case sensitive. In case of missing field in the generated CRM table, it is because you didn’t put all related CRM Entities in the cmdlet. The principal method is ResetConfiguration() who call other ResetXXMapping methods for each table mapping. Example under. We can easly play with those who already exists to remove or change fields mappings. To add new table mapping simply copy one of ResetTableMapping function and adapt to your new table, previously downloaded with the powershell cmdlet. This code will trigger the CRM connector update verification code and fill the Integration Record table, if the table mappings is on synch. all or if the record is coupled. If you have to modify or do any process on Nav or CRM data before integrating it, simply create a new method subscride to a codeunit 5345 Integration Rec. Synch. Invoke event. You have lot of exemple in code unit 5341 CRM Int. Table Subscrider, like the exchange rate calculation on currency synch. with the “OnAfterTransferRecordFields” event. You can now reset to default synchronization to get your changments applies. To handle any synchronization error, open the particuclar table mappings and check Integration Synch. Job Log. If any error occur you can click on the counter to have details. 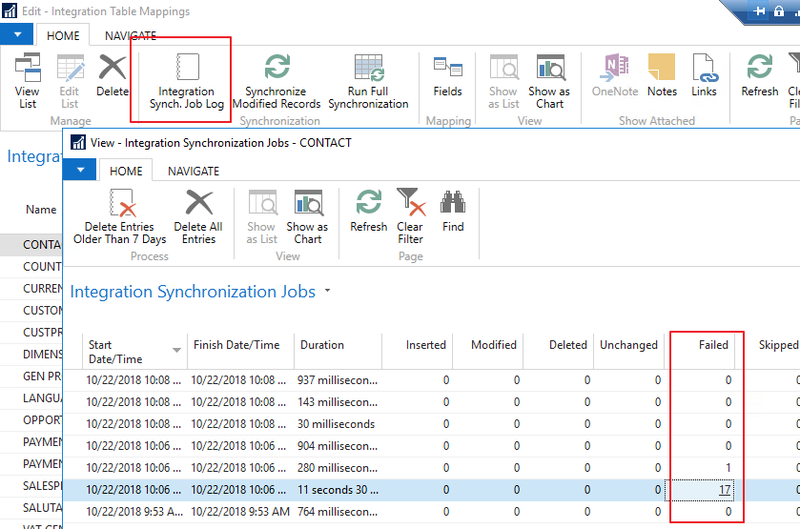 If job queue didn’t launch immediatly you can force a “Run Full Synchronization” manually from the table mappings page.